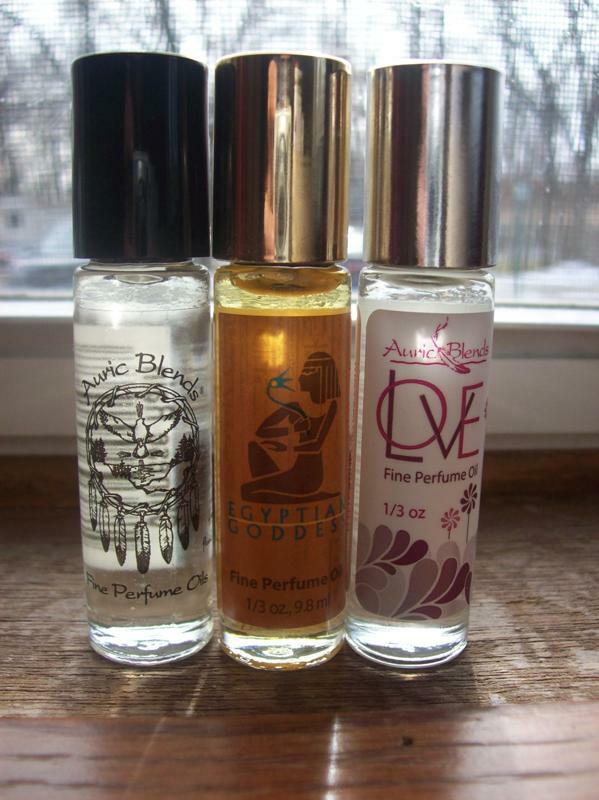 Auric Blends is a company that sells many different scented products. I was sent this set of three perfumes. They all smell great and roll on which is perfect for travel. I am going to keep one in my desk at work in case I need a little perfume during the day. My favorite product that I received was the Love perfume. It smells great and is one of the company's best selling perfumes. Another thing that I like about this company is that they sell so many different scents that you can find a scent that everyone will love. It is also very affordable. 1/3 ounce container of perfume costs $7.50 and since it is strongly scented, this will last awhile. Thanks Auric Blends! Auric Blends will be giving away 2 products (either the 1/3 ounce perfumes or the solid perfumes) in the scent of the winners choice to one lucky reader of my blog! The giveaway is open until Midnight on Tuesday April 12th. Winner will be chosen on Wednesday April 13th using Random.org. The winner will have 48 hours to respond or a new winner will be chosen. Visit the Auric Blends website and let me know what scent sounds the best to you! black opium or chinese rain sounds good!!! I LOVE Auric Blends -- wildly popular at a shop my BFF owns. My all-time fave is Egyptian Goddess! You are on my blogroll (link below) on the bottom to the right. Been there awhile now -- one of my favorite blogs! The scent of Siren sounds like a lovely summer perfume. Egyptian Goddess and Monsoon Rain sound like they would smell great! Vanilla sounds good to me. Thanks. Your blog is awesome!! Good luck with your intership process. Since Egyptian Goddess is the best seller, it must be pretty good. I would love to try the Layla scent. It sounds mysterious. +2 I subscribe via email. I also entered the giveaway for the Exuviance Heel repair cream! I like the water lily scent. I would like to try the Pele version. Anything with Lavender I am a sucker for. I think the black coconut scent sounds really interesting! I would love to try it. The Tara Scent sounds nice. The layla fragrance sounds great! I would like to try the Love Oil! I need some love in my life ! You made it sound so good !